Kingston Greens is an established community located off Myrtle Trace Rd and Timber Ridge Rd, on the outskirts of the Burning Ridge Golf Club. 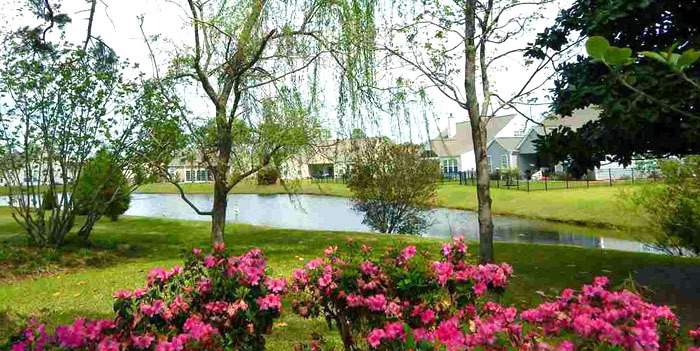 It sits behind the Conway Medical Center and just up the road from Coastal Carolina University. Myrtle Trace Rd is right off Hwy 501, giving the residents direct access to Myrtle Beach and downtown Conway equally. It's about a 15-minute drive to both. Originally developed in the early 90's, Kingston Greens is a small neighborhood of 33 custom built homes with wooded and landscaped lots, mature trees, and several lakes, as well as part of the golf course. Most are larger brick homes that have been renovated and have all the extras; formal dining rooms, Florida rooms, screened porches, 2-car garages, and interior upgrades. There are three and four-bedroom homes in every style, with sizes ranging from 1800 to 3000 square ft. Prices range from the low $200's to about $300,000. Some homes have direct lake views which add to the value. Children attend Ocean Bay Elementary and Middle School, as well as the highly coveted Carolina Forest High School. The community is outside the city limits for low taxes, and HOA fees are very minimal, covering trash pickup and street landscaping. If you want a beautiful home near a golf course, with easy access to everything, you won't find a better place to look than Kingston Greens. Call us for a tour of the homes in Kingston Greens and more information. There are several similar golf communities all around this area as well.